In almost every corner of the globe you can find people of all ages and from all walks of life practicing Falun Dafa. The vast majority of them experience significant improvements in many areas of their lives, including personal feelings, relationships, job satisfaction, and health. In living by the principles of Truthfulness-Benevolence-Forbearance (the principles of Falun Dafa, also expressed in English as Truth-Compassion-Forbearance) many people have discovered a positive state of being they had never before imagined possible. 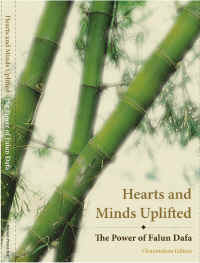 A published collection of short articles, Hearts and Minds Uplifted, describes the tremendous personal growth that can be achieved by cultivating one's character through practicing Falun Gong. The accounts presented in this volume represent only a tiny fraction of those who have benefited from letting go of their attachments and elevating their hearts and minds, giving them renewed lives of spiritual and physical well-being. We invite you to read their stories to discover for yourself why so many people practice Falun Dafa. Hearts and Minds Uplifted--The Power of Falun Dafa can be viewed online here.